1 of 5 Cook pasta in lightly salted water following package directions. Add asparagus to pasta water for last 4 minutes of cooking time. Drain and keep warm. 2 of 5 While pasta is cooking, place bacon in a medium-size nonstick skillet and cook over medium-high heat about 8 minutes, stirring occasionally, or until slightly browned and crisp. Remove from pan with a slotted spoon and drain on a paper towel-lined plate. 3 of 5 In a small saucepan, whisk half-and-half and egg yolks. Cook over medium heat about 8 minutes, whisking constantly, until temperature reaches 160 degree F on an instant-read thermometer. Stir in basil, salt, pepper and nutmeg. 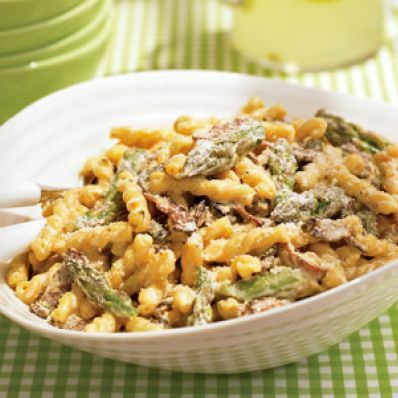 4 of 5 Add bacon to cooked pasta and asparagus. Stir in creamy egg mixture. Stir in 1/3 cup of the Parmesan cheese. 5 of 5 Spoon pasta into a serving bowl and sprinkle remaining 1 tablespoon Parmesan on top. Serve immediately. Per Serving: 648 mg sodium, 4 g fiber, 4 g sat. fat, 11 g Fat, total, 137 mg chol., 51 g carb., 386 kcal cal., 19 g pro.